I RECENTLY had the privilege to attend the annual Coalition for a Tobacco Free Hawaii conference for the first time. It was heartening to listen to reports conveying that Hawaii has the third-lowest adult cigarette smoking prevalence in the nation. The state of Utah has the lowest adult cigarette smoking prevalence and California has the second lowest. It might be easy to sit back basking in thoughts that Hawaii is truly a paradise perpetuating healthy lifestyles, but one needs to consider: Don't we actually have the innate right to good health? Smokers are concerned about having the choice to smoke, but can each of us truly choose where we breath? Hawaii does not have a statewide ordinance for smoke-free environments. All of the counties within Hawaii have separate and diverse smoke-free ordinances. California has comprehensive statewide smoke-free workplace laws, which include all restaurants and bars. They have not experienced a decrease but an increase in food and beverage sales. Is it OK to be the third-lowest state, or is it time to take on the second-lowest -- California? 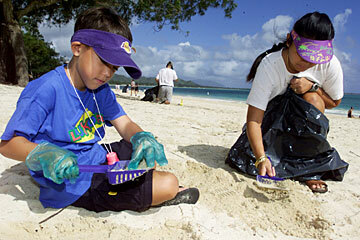 Shane Haggerty and his mom, Natalie, pick up some of the cigarette butts that litter the sand at Kailua Beach Park. The amount of people dying each year within Hawaii from their own smoking is simply unacceptable - 1,100 per year. This averages out each day to three people dying from smoking in our islands. Smoking is killing the people of Hawaii at an alarming rate. Are we to stand by as three of our family, friends, co-workers or neighbors die each day? Is it really their own choice to smoke? Cigarettes release nicotine -- a highly addictive substance -- into the body. Even with treatment and support, it's tough to stop smoking. How about those who do not smoke yet die from others' smoking -- 130 to 230 each year in our islands. This averages out to up to one person in Hawaii dying from others' smoking every two days. Cigarette smoking is the single most preventable cause of death in Hawaii. It is obviously not the time to be complacent with being the third-lowest smoking state. It's time to take on California. Some of our community and political leaders have recognized that they have the inherent responsibility to ensure health for the people of Hawaii. Let's call upon all of Hawaii's leaders to take on this responsibility. Will this legislative session bring about a statewide smoke-free workplace ordinance? Will we continue to have to walk through a cloud of tobacco smoke on our way to our flights at the island airports? Are all hospitals and medical centers going to truly perpetuate health and wellness by becoming smoke free, including their entryways, courtyards and patio areas? Are we going to lower ever-rising health care costs by embracing comprehensive statewide tobacco prevention and cessation programs? As of July 1, all of the prisons in California went smoke-free, saving taxpayers millions in health care costs and without any increase in violence. California is known for health more than Hawaii? People of Hawaii, it's time to take on California. Barbara-Ann Keller is a certified substance abuse counselor and a member of the Maui Tobacco-Free Partnership.